Wholesale Personalized Calculator Thermometer Clocks. Promotional, Inexpensive. Budget Prices in the USA and Canada. Bulk promotional calculator thermometer clocks, custom printed or blank. 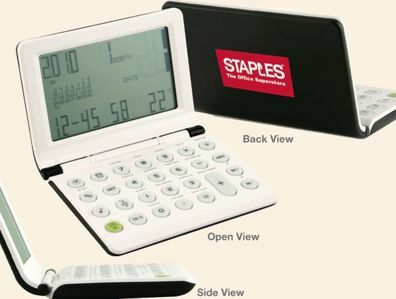 This 12 digits world time calculator with mini laptop design features a large dot matrix LCD display with 16 city world time, calendar, month day date and thermometer. Batteries included. We also supply wholesale blank (not imprinted) clock calculator thermometers for $6.75 each. Lowest prices in USA and Canada for bulk personalized clock calculator thermometer combos. Free artwork design. American clients pay no taxes. We will send you a proof for your approval before production. Prices include your 1 color custom imprint. Additional colors are $0.40 per unit, plus a $45.00 set-up charge. Production time begins after all approvals. Standard production is 7-10 days. Rush 3-day production is also available at extra cost: contact us. Imprint Area : 1" x 2" on the cover. Color: White with Black cover. Production Time: 7-10 working days. Rush 3 day production is available: contact us. Blank (not custom imprinted) clock calculator thermometers ship next day.